We have chosen to analyze the social media representation of the two national holidays that were also the topic of our TV-representation reports: 15th of March and 20th of August. 15th of March is a national holiday in Hungary, the remembrance day of the Hungarian Revolution of 1848 and the war of independence that followed it. The date traditionally symbolizes national independence and the fight for freedom. The date and what it symbolizes played an important role in the anti-communist movements of the late 1980-s as well, and become connected to the establishment of the new Republic in 1989. Since 1990 it is a public holiday. More about the history of the events of 1848-49 in Hungary: https://en.wikipedia.org/wiki/Hungarian_Revolution_of_1848. 20th of August is the leading national holiday in Hungary, commemorating the foundation of the Hungarian State and King Saint Stephen, the first King of Hungary, the founder of the Kingdom of Hungary. He was born a pagan but was baptized as a Christian. He was the first Christian king of Hungary and brought Christianity to the country. King Saint Stephen (997–1038) fought for the unity and protected the independence of the kingdom against pagan warlords and foreign invading troops. Thus 20th August is both a national and Christian holiday, traditionally symbolizing the ‘Thousand Years old (Christian)’ Hungary. In the interwar years the commemoration of ‘Saint Stephen’s State’ was evidently intertwined with the revision of the treaty of Trianon (and the mutilation of historical, Thousand Years old Hungary). During the Socialist decades August 20th became Constitution Day because it was on August 20, 1949 when the Stalinist constitution was declared. The day was ment to be the representative starting point of the new foundational myth and historical narrative of the new, Sovietized Hungary. Besides Constitution Day 20th of August was usually named a ‘the day of the new bread’. The importance of 20th of August as the leading Hungarian national holiday was restored after the political changes of 1989. Nowadays August 20th is celebrated with day-long festivities, culminating in evening fireworks throughout the country. We have analyzed information available from two social media platforms: Facebook and Twitter. Facebook is the most popular SM platform in Hungary. Actually, there used to exist a Hungarian ‘Facebook’ (that actually had been invented and started before Facebook: iwiw [International Who Is Who], but because of the overwhelming popularity of Facebook iwiw has closed down operation a few years ago. Twitter is not very popular in Hungary. According to a Hungarian social media expert Hungary is a one-platform country. Hungarian users seem to prefer only one social media platform at any given time – during the popularity of iwiw, everyone was on iwiw, after 2010 when Facebook started to spread in Hungary, suddenly everyone moved to Facebook and iwiw had to be closed down. There are 5 million Facebook users in Hungary. The popularity of Twitter could not be compared to this. At the moment the only wide spread and popular SM platform in Hungary is Facebook. By using the search functions and the hashtags of FB and Twitter, we tried to identify useful search expressions in connection with the two events that could led to any discussion related to historical topics. The mention of the related historical connections to 15th of March on FB and Twitter was very sporadic. It is not possible to speak about discussions or lines of arguments, what we have found are simply mentions of historical connections, but these mentions had never developed into discussions. These examples are signals of the possible historical topics that common people felt worthy of mentioning in connection to the anniversary. But since we have found only very few examples this material does not provide enough data to make any sort of generalization. What follows is the collection of these sporadic examples that appeared on Twitter and FB on (and around) the 15th of March. Users quoted (without further comments) the famous poem of one of the leading figures of the 1848 revolution, Hungarian poet Sándor Petőfi: “Should we be slaves or free people / This is the question: it is time to choose!” This quote can be read in any political situation as a call for change, but since no discussion was developed around it, it was simply a commemoration of the events and heroes of 1848. Another user stated the importance of the non-violent nature of the 1848 revolution: “Our revolution in Pest on the 15th of March was not a bloodshed, it was a beautiful celebration, the celebration of freedom…” – which is probably true in connection with the day 15th of March, 1848 itself, but obviously not true in relation to the war that followed it. But for the commenter the whole 1848-49 revolution and war of independence is some mythic symbol of freedom and celebration. One compulsory topic that is connected to the 15th of March celebrations on the nationalist side of the political spectrum is the independence/situation of the Hungarians of Transylvania. Several posts mentioned the slogans of the 1848 revolution in connection to the continuous struggles of Hungarians living in Transylvania, and a need for political independence. Only a few users mentioned the official speech of PM Viktor Orbán (for details of the speech see our TV-report about the 15th of March). One of the users summarized the speech in English on Twitter: “#Hungary PM #Orban says, #Brussels equals #migration equals #antisemitism & #homophobia in #marcius15 speech”. But on the 15th of March this year the show was stolen by the teacher-led anti-Orban government protest, that was one of the biggest anti-government protests of recent years. The demonstrators were opposing the educational reforms initiated by the government and wanted open discussions about necessary reforms in primary and secondary education. The demonstration had quite strong public support, so this was one of the main topics of SM on the 15th of March. “933 y ago, the king of #Hungary, Szent Istvan, had to pick between the East and West. He picked West. #Orban? 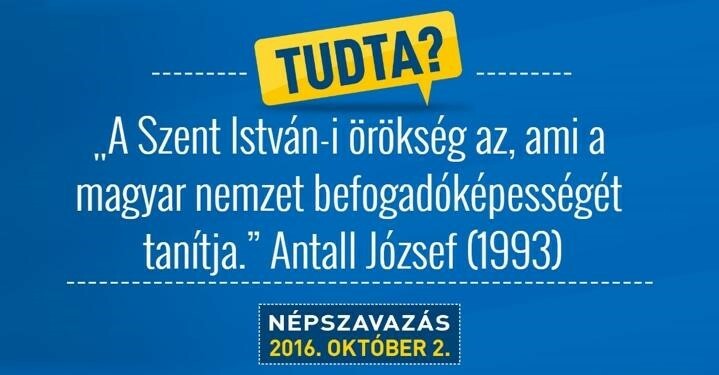 #Augusztus20“. The main topic on Hungarian SM platforms during the national holiday was connected to a controversial case of a very prestigious state award that was granted to a far right journalist who has regularly made anti-Semitic, racist and xenophobic statements. Basically this topic was dominating social media in the days of the national holiday, and references and parallels were made between the manner of speech used by German national socialists in the 1930s and the rhetoric this journalist usually uses. Probably one of the most interesting SM phenomenon currently in Hungary is connected to the ongoing “billboards war”. Since it includes historical references, it is worth to mention here. 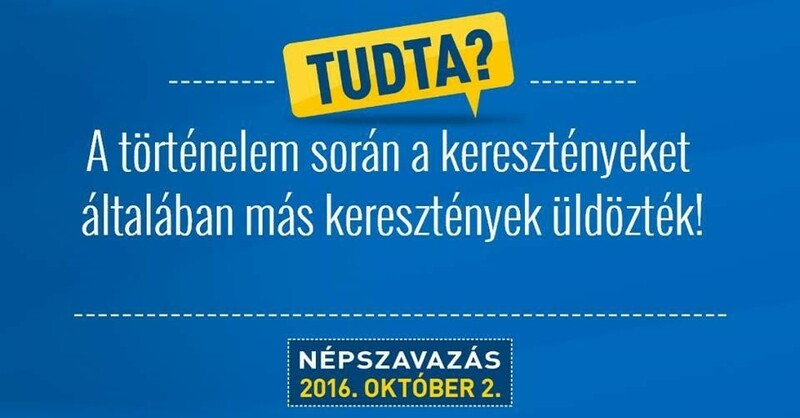 In 2015 The Two-Tailed Dog Party (Hungary’s satire party) raised quite a significant amount of funds in order to start a counter campaign and set up similar blue billboards with different messages. The counter-billboards were reminding the government that its job is to act decent, help the needy, and should not instigate hatred against miserable people. This billboard campaign reminded Hungarians of the historic dimensions of the migration crisis. The saga of the blue billboards restarted this year after the Orban government launched a new anti-migration campaign. This time the government holds a referendum on EU migration quotas on the 2nd of October. The familiar blue billboards have been spread around the country and is designed to make migrants and migration public enemy number one. The Two-Tailed Dog Party has raised, again, significant founds from civilians in order to launch their counter-campaign against the government’s fearmongering (more about the campaign in English: https://euobserver.com/news/134869). Social media users also joined the counter campaign by creating their own blue posters and posting them on Facebook. There is a digital template that can be used to create posters similar to the government’s with different messages. 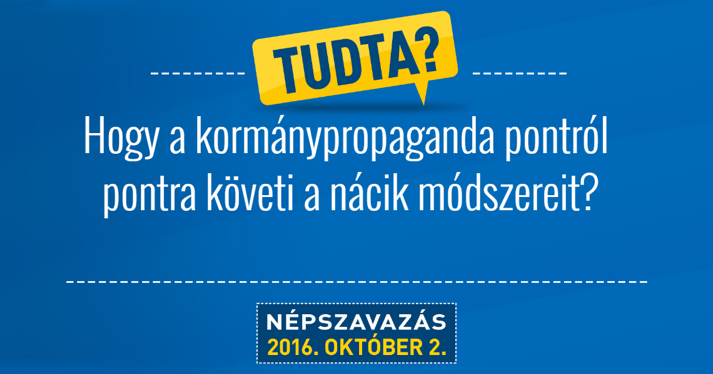 The original billboards have the format that starts with a question: “Tudta?” (Did you know?) and then states some (often unconnected) facts in relation to migration that gives the impression that all migrants are dangerous people, and violence in Europe is committed mainly by migrants. What is interesting here is that there are several posters created and distributed by SM users that refer to historical information. The first democratically elected Hungarian PM after 1989.